Technically not from an estate sale, but $5 at an Ardmore antique shop. This mirror went right up an the mantel and the big one in the laundry room bathroom. Two mirrors and a doll quilt. $2.50, $17.50, $15. This one in pretty good shape. $40. And it has an issue but lovely quilting could be on pillows. Nice, new, table cloth. $2.50. Perfect size for one of the porch tables or layered on the couch. Platter $25. It will be very patriotic serving fresh tomatoes tonight. Some cross stitch pieces. I'm sending these to Miss Mustard Seed. 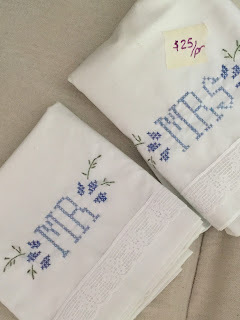 She has been playing around with cross stitch recently and loves blue and white. Table cloth and pillow cases. And sadly two that got away. I shouldn't have walked the dog before running down to the sale today. These were a great size, with lovely patina and only $150 and $100 with Sunday 50% off. Not that I have room for such pieces. Not meant to be.